Zentangle is in large part a mindful method of stress reduction. When one tangles, a meditative calm sets in, often releasing unexpected bubbles of creativity that positively excite us into a focused frame of mind as we concentrate on what the pen is drawing. Sometimes we plan our tangling; sometimes the pen seems to take over and the only things left to our minds is to focus on steady strokes, straight lines, and smooth curves. As we are doing all this, the brain and body release endorphins, and we feel better and better. Endorphins are those feel-good hormones produced by our bodies’ brains and nervous systems to inhibit pain and produce a euphoric state (probably to reduce pain!). They have a calming effect on our nerves. They want to soothe whether the pain is physical or emotional. They also make us want to reach the same levels of feel-goodedness again and again and again. In short, they are addictive. When we are stressed or under psychological pressure, we tend to tighten up, which causes muscles to ache and heads to throb. Whether we think about it not, we need for our systems to release a few endorphins to make the pain and stress go away. If we don’t take proactive measures to reduce the effects of stress, everything gets worse–muscles knot up more, the throbbing in our heads takes on the sensation of being pounded by a psychopathic drummer, aches increase, and so on in a downward cycle. Because we often can’t think straight when we reach the point of physical discomfort, the best proactive approach is to practice endorphin-releasing activities to either lessen the effects of stress or to keep stressful situations from taking us to a point of no return. Some people run every day or two; other people work out at the gym; still others take yoga classes. Some of us Zentangle. Zentangle can be practiced anywhere–in the grocery checkout line, in the doctor’s waiting room, in a restaurant waiting for an order, in front of the TV, in bed–well, anywhere at all. Even if people use smart phones to record appointments and lists, a pencil, pen, and small note pad or artist tile are easy to always slip into a pocket or purse, or keep on the nightstand. 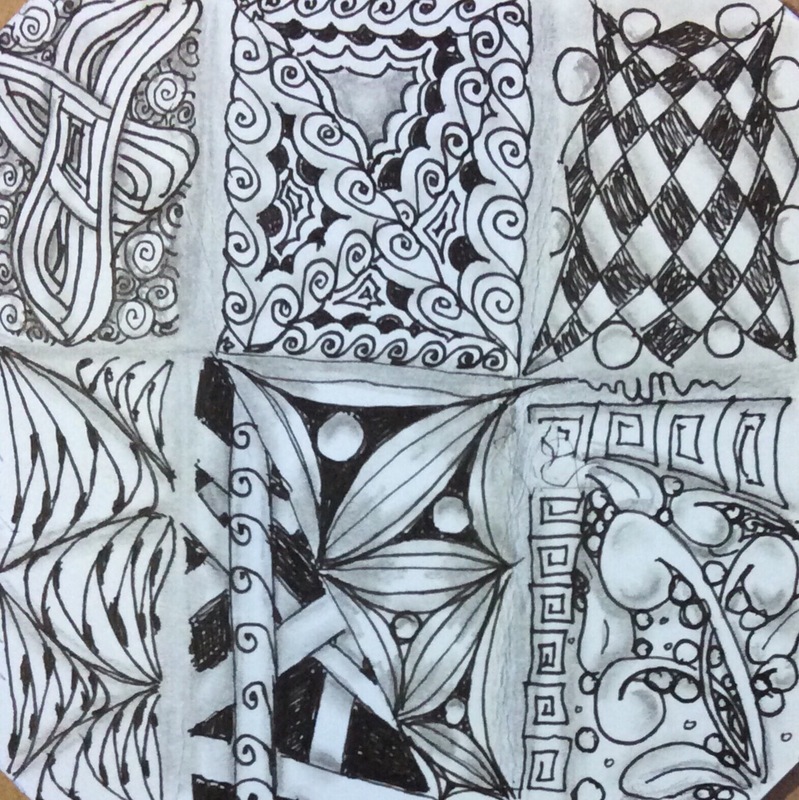 Zentangle requires no special clothes or equipment. A smal amount of time–maybe 15 minutes–is all that’s needed, and no appointments or schedules are required. If the paper or tile gets a little smudged or wrinkled as it travels along with you during the day, those elements just add charm and character to the tangle. Here’s a tile I drew while waiting in the car for my husband’s haircut to be finished. Creases from cell phone pushed on top in my purse were accented with graphite. A scribble from a lost pen cap was incorporated into the design–sort of. Nothing fancy, and I admit I shaded it at home because he came out faster than I expected–but still not a bad little piece of on-the-go tangling. It was a little cramped behind the wheel, as I am very short, but I had enough elbow room to draw and relax a bit ( and I could have moved the seat back). My husband always calls for pick-up too early. Rather than be angry, I tangle while I wait and let the endorphins flow. And if I am not finished when I reach the cashier or my breakfast order arrives (or my husband gets in the car) I can set the tile aside to complete it another time. I don’t need to worry about forgetting what the next step was supposed to be because Zentangles are unplanned. The patterns should be those that come to me when the pen reaches a blank space. When that space is reached–in the next microsecond, a year, or any time in between–the pattern that comes to mind is the one that goes there. It’s OK to plan the patterns; it’s just not necessary. An idea just came to mind. It is time, I think, to tangle another tile and get another endorphin fix.